Brands have stepped up their shoe game for spring 2018! Whether it be espadrilles, wedges, booties, or mules, there are TONS of cute options. 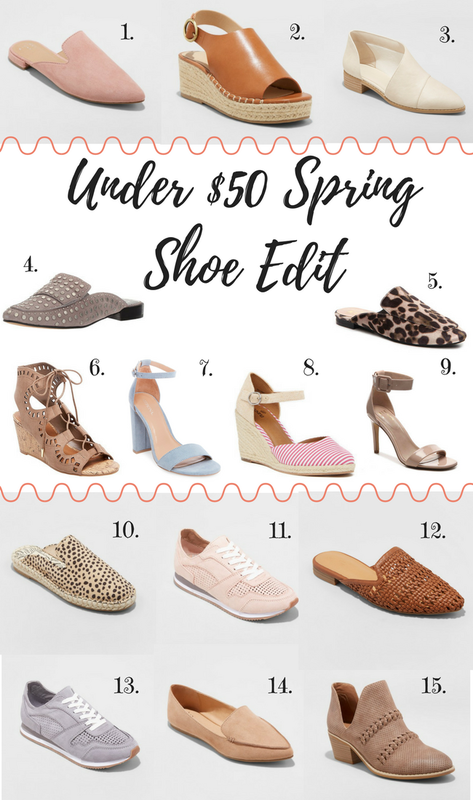 Shoes are one of my favorite things to buy, and I honestly want EVERY SINGLE PAIR in this roundup. The good news is, they're ALL UNDER $50, so I just might get my way. Animal prints like leopard and cheetah will continue to be popular this spring, along with tan, nudes, and blush pink. If you're a fan of the color pink - this is your year! It seems like EVERYTHING is pink. You're also in luck if you don't like high heels because flats will be extremely popular this season (my feet thank the fashion gods). I hope you've enjoyed this roundup, and let me know in the comments if you'd like to see more "Under $50" roundups. Or if you'd prefer another shoe roundup that hits more price points and higher end designers.